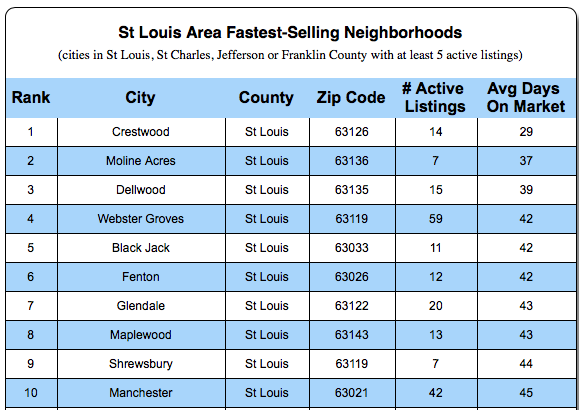 Three of the five St Louis area cities where homes are selling the fastest are in north St Louis County. 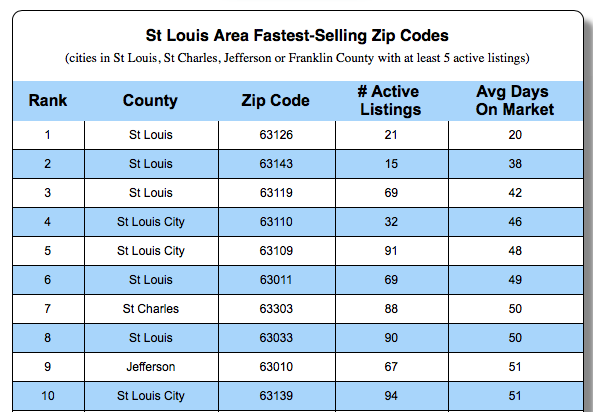 As the table below shows, which ranks St Louis area cities by the average days current listings of homes for sale have been on the market, which is a good measure of how fast homes are selling, the city of Crestwood, with an average of 29 days on the market, is number 1 on the list. In 2nd, 3rd and 5th place respectively are the north St Louis county cities of Moline Acres, Dellwood and Black Jack. Crestwood area zip of 63126 fastest selling zip code..
As the second table below shows, the fastest selling zip code in the St Louis area, 63126, is also in the Crestwood area, putting Crestwood at the top of both “fastest selling” lists. When ranking by zip code, north county zips didn’t show up on the top five list.